This is not the prettiest dish in the world but it tastes lovely and is sort of comfort food for me - it's very quick to make, filling, and most importantly, healthy. The origins of the recipe come from an old healthy eating cookbook of my mum's. I've long since made it my own though. 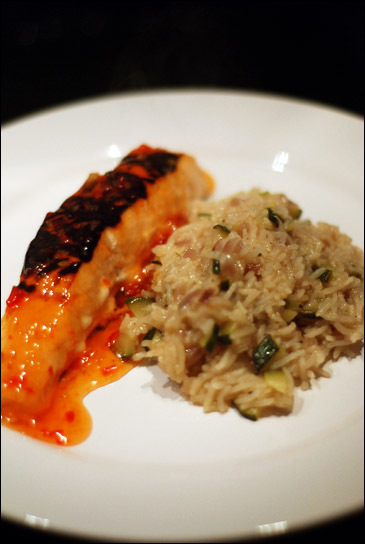 Place the salmon fillets on a plate and pour 4 dessertspoons of sweet chilli sauce over them (recipe here; it's easy enough to make) and leave to marinade for an hour or so. While the salmon is marinading, gently fry your red onion in about a tablespoon of olive oil. When the onions start to turn translucent, add the courgettes, cumin and coriander powder and fry for a further 5 minutes - until the courgettes also begin to turn translucent. Then add in the garlic and rice and fry for a further minute. Finally, add in about two thirds of the chicken stock, the lemon wedges and a good grind of pepper. As it cooks, slowly add the final third of the stock. Cook for about 15 minutes - until the rice is done, stirring occasionally. For the next step I use a George Foreman grill, which doesn't require any extra oil and gives a lovely crust to the salmon, but you can also use a grill or a griddle, though this takes a little longer. For the Foreman, allow about 5 minutes once hot; for a grill, about 7 or 8. Place the salmon fillets in the Foreman and grill for up to 5 minutes. I like mine slightly pink still, so tend to cook them for a little less time (more like 3-4 minutes). You should end up with a chargrilled chilli crust on top. Serve with the rice and a fresh drizzle of sweet chilli sauce. Hi! Delicious recipe - tried it last night and it was so nice we shared the rice for 4 between 2 of us.